The ABC System is an incredibly versatile feature that revolutionizes the comfort of the table and opens up new ways of working. This patent pending design allows you to adjust the contour of the table top to fit your client while they are on the table without disturbing them. The ability to make subtle changes in the area of the breasts to fit each client while offering support for deeper work on the back is revolutionary. In supine positions the ability to raise the platform well above level is great not only as a head support, but for stretching and increasing range of motion when the head is supported by the head rest. 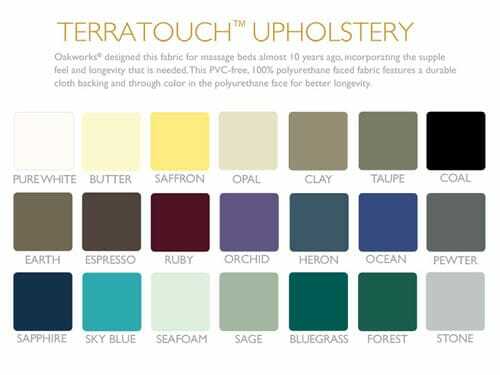 Height Ranges: 24"-34" or 26"-36"
ABC Platform Range: -4" to +4"
Upholstery: (PVC free) TerraTouch™ choose from over 20 colors!